The City of Euless is pleased to announce the appointment of Loretta Getchell as the next City Manager. Getchell holds a Bachelor's Degree in Business Administration from the University of North Alabama. She is also a Certified Public Accountant and a Certified Government Finance Officer. Getchell received unanimous endorsement from the Euless City Council following the retirement of Gary McKamie. Getchell has been a part of the Euless city government for nearly eighteen years. She began in Euless in 1997 and served as the Director of Fiscal and Administrative Service. 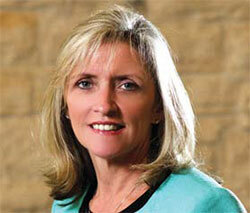 In 2004 she was promoted to Assistant City Manager and in 2008 she was named Deputy City Manager. remarked Loretta Getchell. Euless is a special place that has a history of strong leadership, stability and a spirit of cooperation and teamwork from both the City Councils and previous City Managers. These are exciting times for Euless with tremendous development opportunities for our city thanks to our current Council and those who laid the foundation in the past. We are also fortunate to have dedicated employees who truly care for this city and work every day to make it better.